Hey guys, here is the suspension guide as promised! This could well evolve into the complete rookies guide with controls and everything. 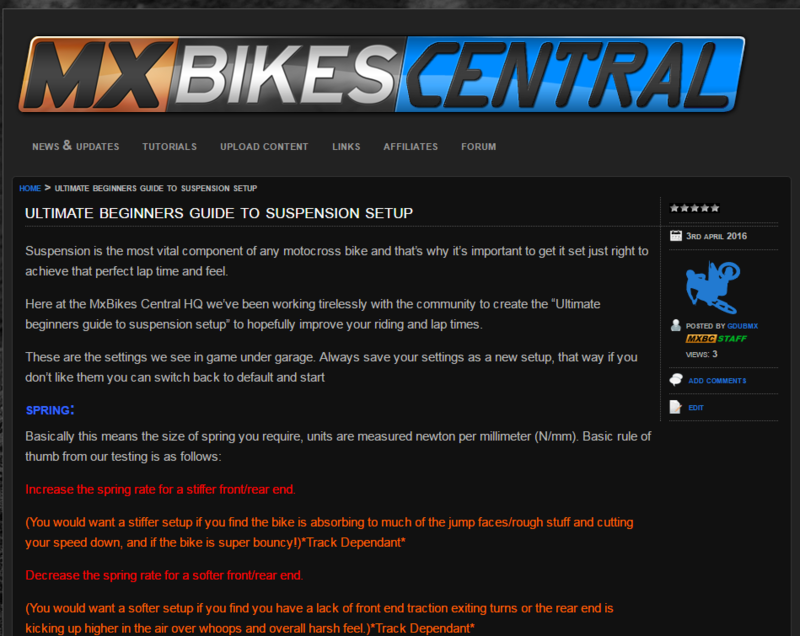 hopefully this will help anyone new to the game or suspension setup in general. *NOTE this guide is not 100% totally accurate and is subject to change with further development and testing. Click the blue text above! Huge thanks to HornetMaX, RC, and Fats for all your help to make this possible. Hey guys thank you very much for sharing all your work. I'm also searching and try hard so many combinaisons to find the right setup or at least understand each set and these effects. and this is not easy at all.. In the reality, the spring is not a value that change on every track. each rider have is type of springs, front and rear, in rapport of his weight. Also the preload is a set who don't change on every track neither. It's a value, just to make sure your race sag is good, and it change in fonction of your bike brand or CC. The good Race sag value is in the manuel of your bike, and you just set your preload to reach that value every time you go on the track. - are bump and compression the same things ? - it's obviously not exactly the same thing as reality. Soo... can Piboso make a tutorial with the all explanation and effect of all setups and some tips for what to do in some situations ? The rider weight is 80kg ( of course in full riding gear ). Thank Pib ! So if i trust all we can read on internet, the good race sag should be about 100 (+-10) rear and 70 (+-5) front. But of course, i guess the Msm's geom got to be really close to the ktm. I really don't know if it is, and more less for the upcoming community's models.